We’d love your help. Let us know what’s wrong with this preview of Massive Change by Bruce Mau. Massive Change is a modern illustrated primer on the new inventions, technologies, and events that are affecting the human race worldwide. The book is a part of a broader research project by Bruce Mau Design intended to provoke debate and discussion about the future of design culture, broadly defined as the "familiar objects and techniques that are transforming our lives." Massive Change is a modern illustrated primer on the new inventions, technologies, and events that are affecting the human race worldwide. The book is a part of a broader research project by Bruce Mau Design intended to provoke debate and discussion about the future of design culture, broadly defined as the "familiar objects and techniques that are transforming our lives." The book is divided into 11 heavily illustrated sections covering major areas of change in contemporary society — such as urbanism and architecture, the military, health and living, and wealth and politics. Each section intersperses intriguing documentary images with a general introductory essay, extended captions, and interviews with leading thinkers, including engineers, designers, philosophers, scientists, architects, artists, and writers. Concluding the book is a graphic timeline of significant inventions and world events from 10,000 B.C. to the present. To ask other readers questions about Massive Change, please sign up. In the words of author and designer Bruce Mau, "Massive Change is not about the world of design; it's about the design of the world." The design of the world is a daunting and broad subject for a book, but somehow the Mau largely delivers on his promise. Massive Change is structured as a series of vignettes focusing on different subjects — bioengineering, housing huge populations, information communication and visualization, eradicating disease, militarism and war, etc. Within each chapter, inter In the words of author and designer Bruce Mau, "Massive Change is not about the world of design; it's about the design of the world." The design of the world is a daunting and broad subject for a book, but somehow the Mau largely delivers on his promise. 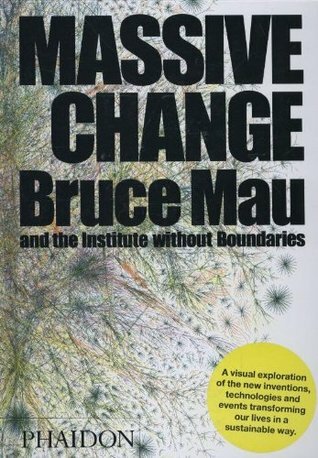 Massive Change is structured as a series of vignettes focusing on different subjects — bioengineering, housing huge populations, information communication and visualization, eradicating disease, militarism and war, etc. Within each chapter, international thought leaders are profiled in often fascinating interviews about their contributions to science and society. The book almost reminds me of a printed version of NPR in the sense that it treads somewhat lightly on complex subjects, but still provides enough interesting insight to inspire further reading. Plus, like NPR, most of the storytelling in the hands of interviewed experts. Although I really enjoyed the book, I thought it was made worse by only relying on liberal ideologies, which came through especially in the chapter about military technology. Although I'm glad the book has a strong point-of-view, some of the interviews on controversial subjects would have been more interesting as one-on-one debates from opposing viewpoints. An exciting book to get into - I love all those OMA-related big colorful books. The problem is that this is one of those visionary books that attempts to throw a big WOW over the nauseating forward motion of science and technology. That would be great if this weren't already fairly dated - nothing fades faster than the big wow of what technology will do to our way of being than a hint of being dated. And it'd not dated enough to be a nostalgic walk through the future of the past. Still, some of An exciting book to get into - I love all those OMA-related big colorful books. The problem is that this is one of those visionary books that attempts to throw a big WOW over the nauseating forward motion of science and technology. That would be great if this weren't already fairly dated - nothing fades faster than the big wow of what technology will do to our way of being than a hint of being dated. And it'd not dated enough to be a nostalgic walk through the future of the past. This book tries to motivate society to think of the entirety of humanity when faced with an objective. Massive Change is structured in a pick up and glance format (which I didn't know going in, I assume the format was intentional?). Minimal depth, quick interviews, large photos with brief motivational statements. More of a coffee table book than anything, this book will only function in that setting. Sitting down to read this cover to cover is more frustrating than enjoyable because of its lack This book tries to motivate society to think of the entirety of humanity when faced with an objective. Massive Change is structured in a pick up and glance format (which I didn't know going in, I assume the format was intentional?). Minimal depth, quick interviews, large photos with brief motivational statements. More of a coffee table book than anything, this book will only function in that setting. Sitting down to read this cover to cover is more frustrating than enjoyable because of its lack of depth and sporadic structure. Its more of a coffee table book. Simple spreads about a topic or a person of interest vision on what is out there to be done in this field. Ultimately Mau is trying to perform the binding of many fields together in one book under the title of design. The article on Curitiba, Brazil made me completely re-think urban rapid transit to encapsulate something that is a more open system (buses with movable docking terminals that can grow and change with a city instead of a closed system like a rails. This book takes on a huge challenge and doesn't completely succeed. It doesn't completely fail either. The book is well-organized and beautiful to look at. There are interviews with people who are prominent in various areas of industrial design and related fields. The themes are important: Responsibility, sustainability, the application of technology to human problems. It made me want to learn more. This is a hugely important book to me. Everytime I need some direction, am depressed with the state of the world, and/or I don't know what the hell is going on with my life, I have to read this book. It's hopeful and optimistic to a degree that I could never be; a perfect foil, if you would. This book could be my mentor in design. It was, and still is an absolute must-read for me. Our world is changing ever more rapidly and at ever larger scale. Contributing essayists give a glimpse of our future ranging from information and science to medicine and health to infrastructure and the environment. I am a policy analyst dealing with clean energy and the environment and find this book to be very uplifting that we can indeed meet the challenges of this new century. So smart! People too often write design off as trivial because they think that it is just about "making things pretty." Read this a while ago, basic overview of developments. However it read like techno-sensationalism. No challenges to social structures or bases of problems. Full of interesting ideas, some are appealing and some are kind of worrisome. I the basic premise and optimism of the project are refreshing, but I sometimes wondered "were have i heard this before?" There are some great photographs in this book and information on new technology related to sustainability. bruce mau yo. bruce mau. This pretentious book is hopeful in the feeling that, YEAH WE CAN DO IT! but a big let down when you realize, WHY WE LREADY DOING IT ALL THE TIME AND THERE'S STILL SHITTINESS! changing the world through graphic design. This is an excellent compilation of where mankind is doing great things around the world in many endeavors that will be important to renewable and sustainable cultures. After seeing the exhibit, I need to get a copy and devour it. this is a great eclectic mix of crazy thoughts. it's visual. The exhibit, while it was in Chicago, was great as well. Excellent source for urban planners, alternative energy companies, architects, etc. The book focuses on what we should do by exploring what we should expect in the future. Not really a reading-type of material. Never finished due to disinterest. Great resource for new approaches and ideas developed and being developed out there. It was fascinating. Mau was born in Sudbury, Ontario. He studied at the Ontario College of Art & Design in Toronto, but left prior to graduation in order to join the Fifty Fingers design group in 1980. He stayed there for two years, before crossing the ocean for a brief sojourn at Pentagram in the UK. Returning to Toronto a year later, he became part of the founding triumvirate of Public Good Design and Communica Mau was born in Sudbury, Ontario. He studied at the Ontario College of Art & Design in Toronto, but left prior to graduation in order to join the Fifty Fingers design group in 1980. He stayed there for two years, before crossing the ocean for a brief sojourn at Pentagram in the UK. Returning to Toronto a year later, he became part of the founding triumvirate of Public Good Design and Communications. Soon after, the opportunity to design Zone 1/2 presented itself and he left to establish his own studio, Bruce Mau Design. From 1991-93, he also served as creative director of I.D. magazine. In addition, Bruce is an honorary fellow of the Ontario College of Art & Design and a member of the Royal Canadian Academy of Arts. He was awarded the Chrysler Award for Design Innovation in 1998, and the Toronto Arts Award for Architecture and Design in 1999. In 2001 he received an Honorary Doctor of Letters from the Emily Carr University of Art and Design in Vancouver. He is also a Senior Fellow of the Design Futures Council. In 2006, he participated in the Stock Exchange of Visions. As of 2007, Mau was in residence at The School of the Art Institute of Chicago, in the Architecture, Interior Architecture, and Design Objects Department.